Published Jun 16, 2017 by Addison-Wesley Professional. Part of the LiveLessons series. 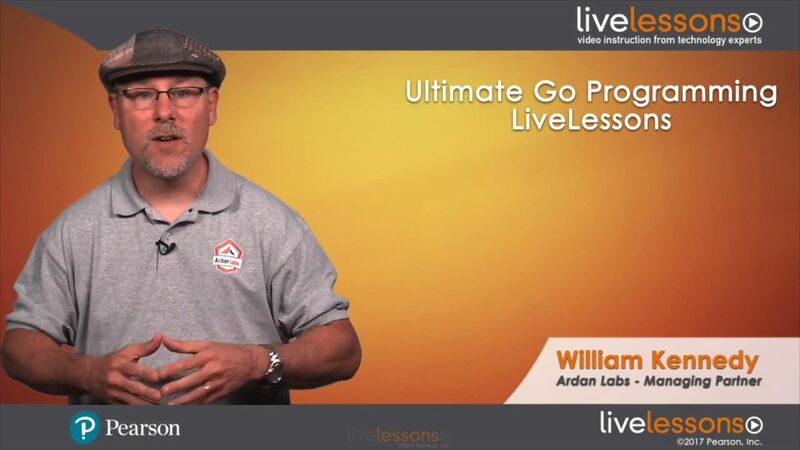 In this video training, Bill Kennedy starts by providing a deep and intensive dive into Go’s language syntax, idioms, implementation, and specification. Then Bill guides you through the essential things you need to know about designing software in Go. With that strong foundation, Bill then teaches the language mechanics behind Go’s concurrency primitives and covers all the things you need to know to design concurrent software. Finally, Bill covers the tooling Go provides for testing, tracing, and profiling your programs. William Kennedy is a managing partner at Ardan Studio in Miami, Florida, a mobile, web, and systems development company. He is also a coauthor of the book Go in Action, the author of the blog "GoingGo.Net," and a founding member of GoBridge, which is working to increase Go adoption through embracing diversity. Any intermediate-level developer who has some experience with other programming languages and wants to learn Go. This video is perfect for anyone who wants a jump-start in learning Go or wants a more thorough understanding of the language, its internals and how to design software. Studied CS in school or has a minimum of two years of experience programming full time professionally. Familiar with structural and object-oriented programming styles. Has worked with arrays, lists, queues and stacks. Understands processes, threads and synchronization at a high level. Pearson publishes expert-led video tutorials covering a wide selection of technology topics designed to teach you the skills you need to succeed. These professional and personal technology videos feature world-leading author instructors published by your trusted technology brands: Addison-Wesley, Cisco Press, Pearson IT Certification, Prentice Hall, Sams, and Que. Topics include: IT Certification, Programming, Web Development, Mobile Development, Home and Office Technologies, Business and Management, and more. Learn more about Pearson Video Training at http://www.informit.com/video.